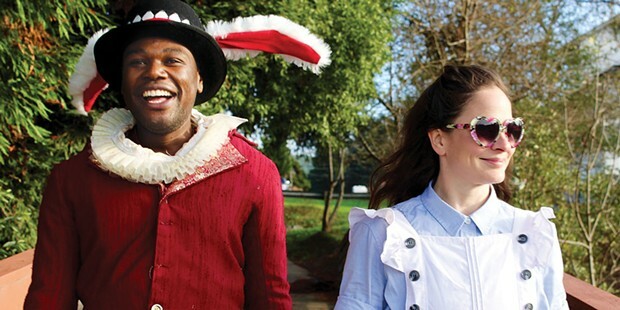 Tafadzwa "Bob" Mutumbi and Jenny Lamb in Wonderland. Each year, Dell'Arte MFA students create a holiday show that plays, largely free of charge, to the community from Point Arena to Cave Junction. The students not only write, design, choreograph, costume, light and stage the production but also take it on the road to schools, community centers and theatres large and small. Being Dell'Arte students, they also stretch the bounds of possibility in their quest for holiday fun for all — Alice in Wonderland is quite possibly the most bound-stretching of them all. This particular interpretation began in the brain of student Jenny Lamb, traveled through both of Lewis Carroll's masterworks, and fermented for a couple months in the creative juices of all 12 third-year MFA students under the direction of Dell'Arte's Producing Artistic Director Michael Fields. That the players hail from seven countries, each with its own traditions of the absurd, only adds to the possibilities. Our contemporized Wonderland adventure begins with 11-year-old Alice (an engaging performance by Lamb that balances a child's innocence and a teen's frustrations with a slow realization that she can be who she wants to be) facing massive changes in her life. She's been transported from the city to rural Northern California by her mother (the disembodied voice of Joan Schirle). Her only friends are hundreds of miles away at the other end of a smartphone connection and all she can think of is how small, insignificant and out of place she feels in this new world. But just as she breaks into a heart-rending "everything is stupid" lament, an insanely fat-suited and fabulously costumed White Rabbit (Tafadzwa "Bob" Mutumbi) rushes in, muttering about invitations and a lost tree. He begins to carry Alice off into the woods when a familiar parade of Carroll characters marches in, looking rather as if they had taken a detour through The Rocky Horror Show (this is not a bad thing). Three animated playing cards (Tushar Mathew, Emilia Björk, Grayson Bradshaw), a White Knight (Taylor Brewerton in a wonderfully Pythonesque performance), a Duchess with an unfortunate pepper allergy (Zafiria Dimitropolou), the March Hare (Jeesun Choi), the Mad Hatter (Rebecca Finney), a far-out, sparkly DJ Caterpillar (Kevin Duvall) and an imperious Red Queen (Anne Kjær Wæhrens). Alice in Wonderland is perhaps the most appropriate choice ever for a Humboldt County theater-of-place production. Not only are we widely regarded by the outside world as living in some kind of hallucinatory alternate universe, but even the Humboldt tourism folks now invite visitors to "follow the magic" with Alice through the redwoods to a Mad Hatter's tea party on a North Coast bluff. Dell'Arte's trip down the virtual rabbit hole perfectly captures the feeling of not fitting in with anything anywhere — literally, in the case of Alice's ever-changing size. None of the characters she meets remembers her actual name. Her clothes are ridiculed. No one seems to understand what she's saying and everyone but her seems to be crazy. These universal human themes are effectively transported from Victorian London to 21st century rural California by the ensemble cast and will be instantly recognizable by anyone who's gone through middle school (younger kids will enjoy the fast-paced action and sheer physicality of this upbeat production). The fantastical costumes, designed by Lynnie Horrigan, bring every character to a state much larger than life, and the songs, created by the cast and sound designer Tim Gray, are an appropriate reflection of the characters delivering them. Michael Foster's subtle lighting and James Hildebrandt's typically minimalist set of painted panels and movable doors are the perfect canvas on which our imaginations can build our own Wonderland stories. Alice in Wonderland plays at locations countywide through Dec. 18. See the Calendar for details. Call 668-5663 or visit www.dellarte.com. With a strong cast and pitch-perfect mystery genre notes, The Hollow plays at the North Coast Repertory Theatre on Fridays and Saturdays at 8 p.m. through Dec. 9, with a Sunday matinee at 2 p.m. on Dec. 4, as well as an 8 p.m. show on Thursday, Dec. 8. For more information, call 444-NCRT or visit www.ncrt.net. Spend the holiday with the all-kids Peanuts gang through Dec. 18 at Ferndale Repertory Theatre's A Charlie Brown Christmas. The hour-long show is just the thing for little ones, with suitably glum Charlie and a poignant Linus. Call 786-5483 or visit www.ferndalerep.org. Go big or go giant when Arcata Playhouse stages Jack and the Holiday Beans starting Thursday, Dec. 1. The family-friendly musical comedy runs through Dec. 10. Call 822-1575 or visit www. arcataplayhouse.org. See what the kids are up to at Recycled Youth's The Ride. From Dec. 1-3, they're tackling bees, the Dakota Pipeline, prisons and gender with comedy, dance, music and more at the Mateel Community Center. Call 923-3368. From Friday, Dec. 2 through Dec. 11, Columbinus at Humboldt State University's Gist Hall draws on the 1999 mass shooting at Colorado's Columbine High school to examine societal issues. Call 826-3928.